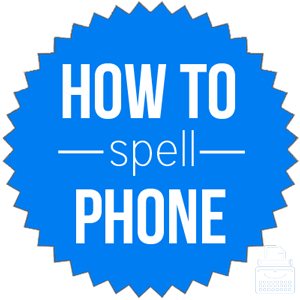 Spelling of Phone: Phone is spelled p-h-o-n-e. Definition of Phone: Phone is short for telephone. It is a piece of technology that is used to make voice calls to other people who also have phones. In the modern world, there are different types of phones, including landline phone, cellular phones, satellite phones, smart phones, etc. Pronunciation of Phone: Phone is pronounced fone. The “ph-” combination makes an “f” sound and the “-o” is long because of the “-e” on the end. The word phone rhymes with drone. What does phone mean? Phone can function as a noun or verb. A phone is a piece of technological equipment used to communicate via voice calls with other people who also have a telephone. He answered the phone only to hear an unrecognizable voice on the other end. He waited all day for the phone to ring, but it never did. Phone also functions as a verb meaning to make or to try to make a telephone connection with, place a call to or to dial (a specific number). To phone someone means to contact another person using a telephone connection. Are you going to phone your mother to let her know you made it here safely? I have to go, but I want you to phone me later so we can talk more about it. Phone it in: to do something with little interest or in a careless way. It appeared that one of the actresses in the play was just phoning it in. The word phone was first used in 1885, according to Merriam-Webster’s. The word phone is short for telephone. Phone comes from the Greek word phone, meaning sound, voice. Phone is the abbreviation, or short form, of the word telephone. It can function as either a noun or verb. As a noun, it refers to the actual piece of equipment used to make voice calls to other people with phones. As a verb, it refers to act of calling or dialing another phone in an attempt to communicate over a phone signal.